Cook bacon according to package directions, either in a pan with nonstick spray or in the microwave. Once cool enough to handle, roughly chop and set aside. Bring a medium-large pan (at least the size of the tortilla) sprayed with non-stick spray to medium heat. Add peppers and onion and cook until softened, about 3 minutes. Add egg substitute and scramble until fully cooked. Transfer mixture to a bowl and set pan aside to cool. Add bacon, beans, 1 tablespoon sour cream and salsa verde (not the regular salsa) to the egg-scramble bowl. If you like, add cilantro as well. Lightly mix and set aside. Clean and dry the pan, spray with non-stick spray, and bring to medium-high heat. Place tortilla flat in the pan and sprinkle evenly with cheese. Spoon egg mixture over one half of the tortilla, fold the other half over the mixture to form the quesadilla, and then press down with a spatula to seal. Plate your quesadilla and cut it into triangles. Top with salsa and a tablespoon sour cream. Enjoy! 272 members have added this recipe to their cookbook. I used Turkey Bacon as well. I ate mine in 3 minutes. very delicious. Make it with turkey bacon~ delish! An easy, warm and very good spicy lentils with great flavors. 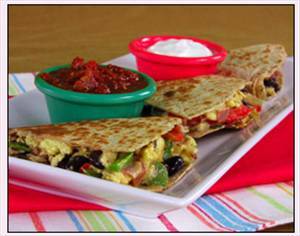 There are 404 calories in 1 serving of Breakfast Quesadillas. Calorie break-down: 31% fat, 38% carbs, 31% protein.